Dragon arrives at one of the Bellco Chemicals’ plants where a group of Vicious Circle thugs are apparently holding his children hostage. He fights his way through the lower tier super-freaks until he comes up against the more dangerous super-freaks. Tumor blocks the path inside the facility but he is thrown into the Blue Flame flying up above. With these two villains down, Dragon is left with one final opponent who wishes to end the fight quickly so that he can grab a cheeseburger but he is sent flying through the floor and into a vat of chemicals. Dragon reaches the room where his children are supposedly being incarcerated but the room explodes and catches the hero in the blast. 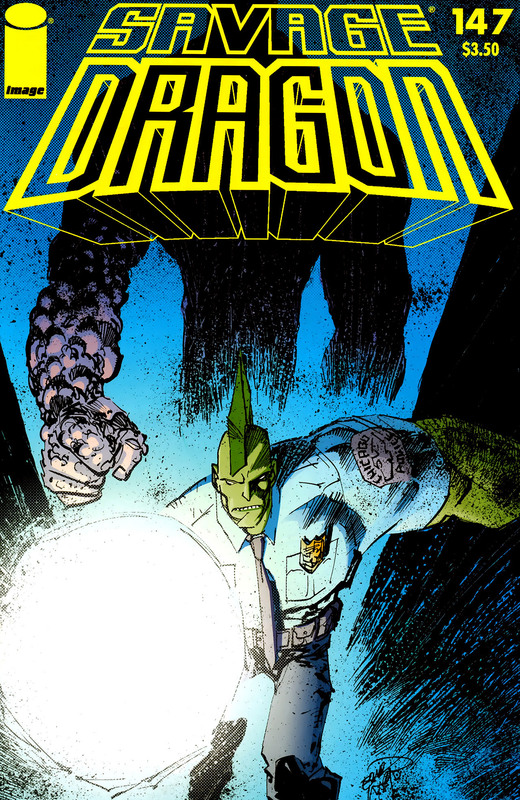 The explosion tears off Dragon’s skin and fin, leaving officers from the Chicago Police Department to rush him to Hillman Hospital. He shrugs off the injuries as he is confident that he will be back to full health within two days’ time. Dragon is visited by a few of his friends whom he asks for help in his search for his kidnapped children. Rex Dexter does not believe that he can create a device to locate the youngsters but Dragon pleads with him to at least try. SuperPatriot declares that he cover Dragon for the duration of his recovery period so he need not concern himself. Ann Stevens is concerned that her patient should be taking things a bit easier as Dragon is not as young as he used to be and all of his various injuries will eventually take their toll on his body. Dragon asks that she transform into Mighty Man and join the fight against crime. Ann claims to be too busy with taking care of her patients, an excuse that does not impress Dragon. One of the villains that had abducted the children carries out an assault upon Dragon, stating that the Vicious Circle will liberate Malcolm and Angel should he surrender himself for execution. Dragon does not trust that his kids will be spared and warns that should the Vicious Circle harm them, he will tear into the criminal organization to claim vengeance. He defeats Bug-Lady moments before the new police captain arrives to introduce himself to Dragon. Back at Bellco Chemicals, two officers go over the wreckage caused by the explosion. Jerry Zout mocks his partner, joking how he is having an affair with his wife. Dwayne DePool laughs off his partner’s immature jibes to search the chemical planet. The super-freak that had fallen into the vat emerges, horribly mutated into a creature called Virus. He attacks Dwayne and drains him of his bodily fluids before consuming his brain, absorbing all of his memories. Captain Gus Turpin explains how he has been assigned to head up the new police precinct and has been having a tough time putting together a roster of officers. There are many cops that refuse to work anywhere near Dragon while others cannot wait for the opportunity, eager to go after the Vicious Circle with excessive force. A mixture of rookies and veterans are currently filling the ranks but there is much work still to be done. Turpin and Dragon discuss what could have destroyed the old precinct and it is theorized that the memento that Ray Wong had mentioned just before the explosion could be involved. As he is leaving the hospital, Captain Turpin is approached by Dwayne DePool who seems to arrive on the scene. He is soon revealed to be Virus, having taken on the appearance of his first victim. Virus kills the new captain and feasts on his brain to learn Dragon’s current location. The murderous monster begins killing his way through Hillman Hospital until he finally encounters the man who ruined his life by turning him into a monster. Virus soon overpowers and claims his revenge, draining him into a near-skeletal form before breaking open his skull and eating his brains. A pair of police officers arrives to witness this death but Virus suddenly collapses to the ground in pain and begins transforming. The cops recall how Dragon’s blood once transformed someone and they watch on as Virus become a perfect duplicate of Dragon. Virus seems to be gone and Dragon has taken his place. He undergoes numerous genetic, psychological, physical and other tests to confirm that he is the genuine article. Dragon claims to feel perfectly fine in his new body but he does not that he could really go for a cheeseburger. James Peterson is brought to room where Hackett Military Base’s commanding officer begins to question him through a two-way mirror. Captain Pike explains that he wants some answers from his young captive and as James is a military prisoner, he can keep him locked up indefinitely without charge by using the cover of him being a suspected terrorist. With this threat out of the way, Pike wonders how he and Charlie Hendrix survived the fog. It is confirmed that there was no meteor and that aliens really were involved, using their technology to create a huge tower that is in the middle of the fog. James notes that he encountered an extraterrestrial that chased him and his best friend out of the Hot Zone. He then asks if there is any news on his missing girlfriend but Pike is not hopeful that she has survived.